Sea temperature 28 degrees celsius, Air temperature 26.4 degrees celsius. Well we have come to the end of the cruise so now it is time to tie it all the pieces together. 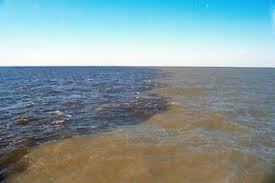 The Gulf of Mexico contains a large ecosystem which is made up of both biotic (living) and abiotic (nonliving) factors. We studied the abiotic factors using the CTD which records water chemistry data and by recording information on the water depth, water color, water temperature, and weather conditions. We studied the living portions of the ecosystem by collecting plankton in the bongo and neuston nets. The health of the plankton depends on the abiotic factors such as water temperature and water clarity so if the abiotic factors are affected by some human input then the plankton will be unhealthy. The trawl net allowed us to collect some larger organisms which occupy the upper part of the food web. 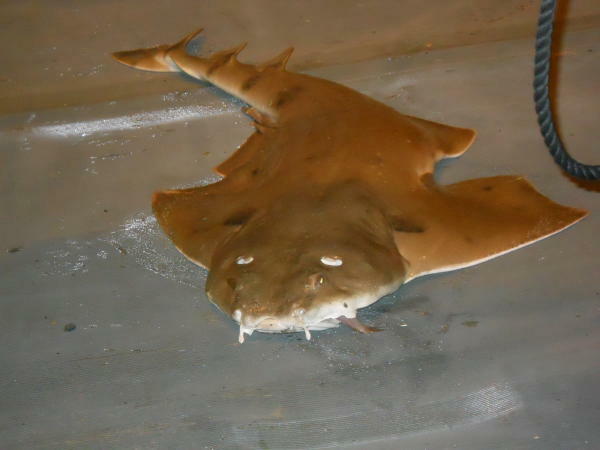 Some of these organisms eat the plankton while others eat bigger creatures which are also found in the trawl net. Despite what they eat all of these creatures depend on the health of the levels below them either because those levels are directly their food or because those levels are the food of their food. The ecosystem of the Gulf of Mexico has taken a couple of large hits in the recent past, first with Hurricane Katrina and then with the Deepwater horizon oil spill. When an ecosystem has undergone such major events it is important to monitor the species in order to determine if there is an effect from the disasters. Hurricane Katrina left its mark on the people of the Gulf coast but did minimal damage to the biotic parts of the ecosystem. 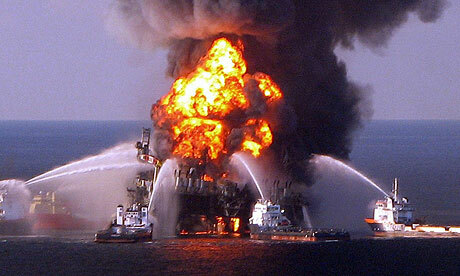 The effects of the deepwater horizon oil spill are still unknown due to the scope of the spill. Today’s portion of the ship is the engine room. I was recently taken on a tour of the engine room by William. 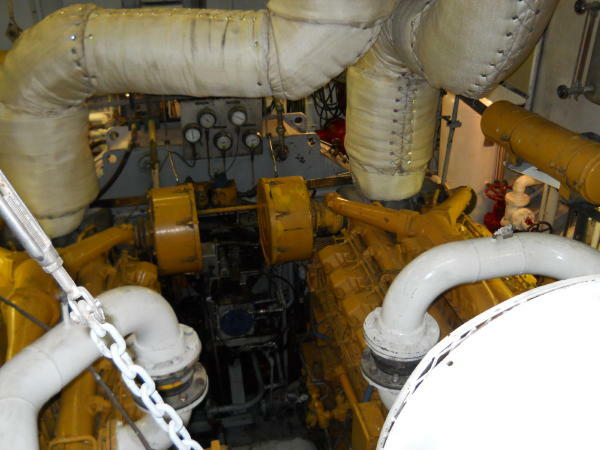 The ship is powered by two diesel engines which use approximately 1,000 gallons of fuel per day. The ship obviously uses the engines to move from location to location but it also uses the energy to power generators which supply electrical energy, to air condition the ship and to make fresh water out of sea water. There are two vital positions on the Oregon II that I have not discussed, deck worker and engineer. 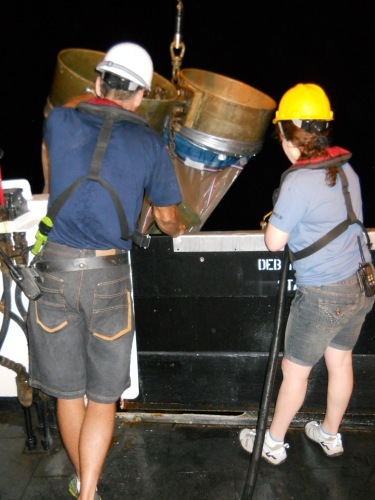 We could never have collected the samples that we did without the immense help of the deck workers. 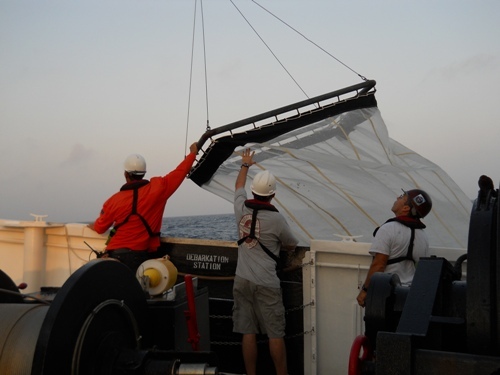 They operated the winches and cranes that allowed us to deploy and bring back the nets which captured our samples. 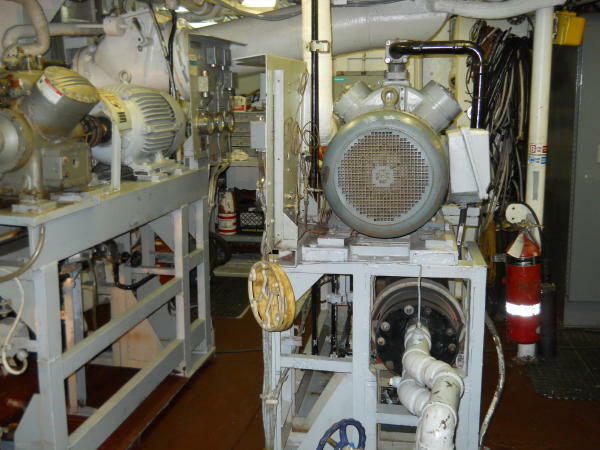 The engineers kept the ship’s engines running, the electricity on, and the rooms cool. Some of these men started out their careers as merchant marines. A merchant marine is a person who works on a civilian-owned merchant vessel such as a deep-sea merchant ship, tug boat, ferry or dredge. There are a variety of jobs on these ships so if you are interested in this line of work I’m sure you could find something to do as a career. A few merchant marines work as captains of those civilian ships, guiding the ship and commanding the crew in order the get the job done. More of them serve as mates, which are assistants to the captains. These people are in training to one day become a captain of their own ship. Just like on the Oregon II there are also engineers and deck workers in the merchant marines. Engineers are expected to keep the machinery running while the deck workers do the heavy lifting on the deck and keep the ship in good condition by performing general maintenance. During this cruise I have met a lot of people who have different jobs all of which are related to collecting scientific data. The bridge is wonderfully staffed by members of the NOAA Corps. These men and women train hard to be able to sail research ships around the world. To find out more about a profession with the NOAA Corps go visit the Corps’ webpage. There are a large number of scientists on board. These scientists all specialize in the marine environment and there are many wonderful universities which offer degrees for this field of study. Go here to get some more information on this scientific pursuit. The engineers and deck crew keep the ship running. To learn about these professions go to The United States Merchant Marines Academy. The stewards are instrumental in keeping the crew going on a daily basis by providing good healthy meals. To learn more about working as a steward read about the Navy culinary school. The ship could not continue to operate without each of these workers. Nobody is more or less important than the next–they survive as a group and if they cannot work together the ship stops operating. Well my journey has come to an end and it is bitter-sweet. While I’m happy to be back on land, I’m sad to say goodbye to all of the wonderful people on the Oregon II. When I was starting this adventure I thought two weeks was going to be a long time to be at sea, yet it went by so fast. 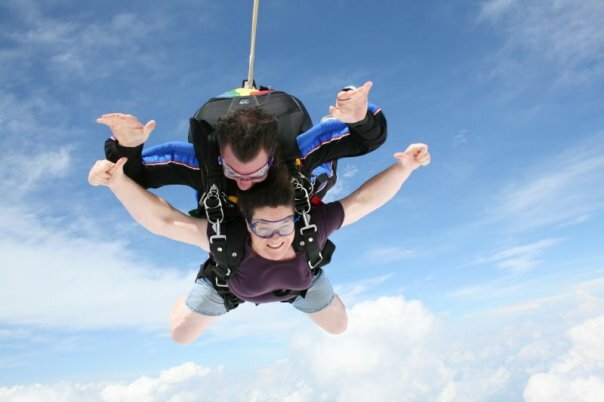 Although I’m tired, my sleep and eating schedule are all messed up, and I have some wicked bruises, I would do it again. I had a great time and in a couple of years I have a feeling I will be once again applying for the Teacher at Sea Program. It should be no surprise to those that know me best that I love animals which is why I volunteer at the zoo and travel to distant locations to see animals in the wild. So my favorite part of the trip was seeing all the animals, both those that came out of the sea and those that flew to our deck. So I’m going to end with a slide show of some amazing animals. 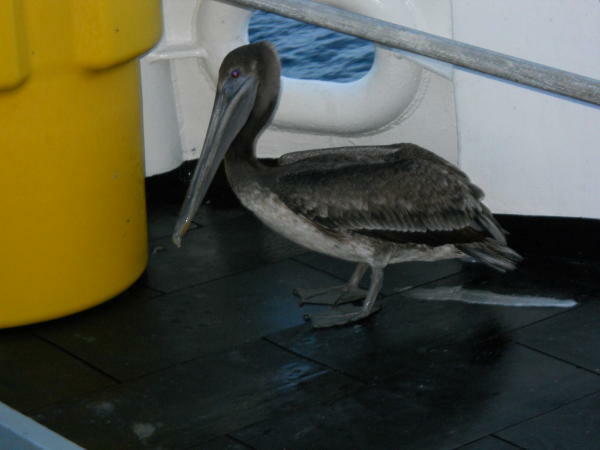 This pelican decided to stop and visit with us for a while. Two bat fishes of very different sizes. 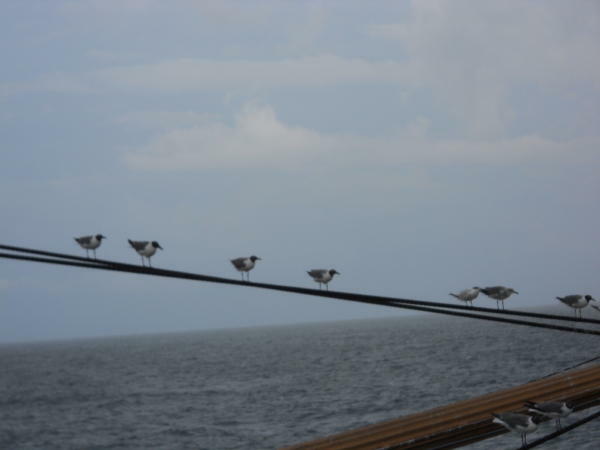 A group of sea birds decide to hitch a ride for a while. Sea temperature 28 degrees celsius, Air temperature 26.4 degrees celsius, building seas. Today I want to discuss the neuston net. This is a very large net made out of finely woven mesh which is deployed (shoved off the side of the boat) in order to catch plankton. There are three types of plankton: phytoplankton (plants and algae), zooplankton (animals), and ichytoplankton (baby fish). The neuston net rides along the surface of the water for ten minutes scooping up any organisms which are near the surface. After the ten minutes are up, the deck crew uses a crane to pull the net out of the water and bring it up to the point where someone can wash it down with a hose. This is necessary because not all of the plankton ends up in the cod end (the place where the collection jar is located) so we have to use a hose to get all of the loose stuff washed into the end of the net. After the net is washed down, the cod end is carefully removed, placed in a bucket and taken to the stern (back) of the ship where it is processed. This is how the neuston net is moved from the ship into the water. From left to right Jeff, Marshall, and Chris are safely deploying the net. To process the sample you must first empty the contents of the cod end into a filter which will allow the water to run out but will keep the sample. Then you transfer (move) the sample from the filter into a glass sample jar. Sometimes the sample smoothly slides into the jar and other times you have to wash down the filter with some ethanol. Once all of the sample is in the jar it is topped off with ethanol, a tag is placed inside the jar, and another tag is put on top of the jar. 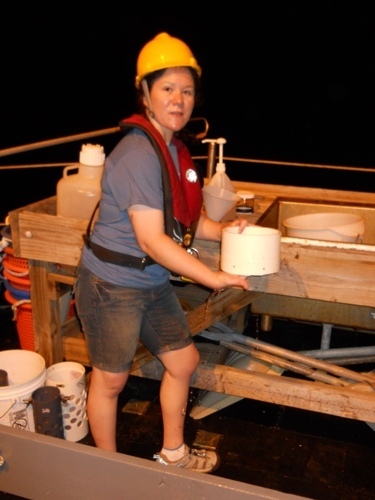 This sample is stored on the boat and taken back to the NOAA lab where it will be cataloged. Today is our fifth day at sea and I’m feeling fairly comfortable with my duties on the ship. I was assigned to the night watch which runs from midnight till noon the next day. I’ll admit I didn’t make it the entire time the first day. We got done early and despite my intentions to stay up until my shift, I would have ended I falling asleep. The second night was better. I was beyond exhausted at the end, but I did manage to make it through the entire shift. At this point my mind and body have adjusted to the shift and I can easily drift to sleep at 3 pm and get up at 11:15 pm. Students, this is a great example of what it means to be responsible. If I was given the choice, do you think I would have chosen these crazy hours or to work twelve hours straight? No of course not but I really wanted to come on this expedition and this work assignment is part of the trip. So I’m doing the same thing I would expect you to do in a situation like this: accept it and get the work done. Now I don’t want you to think that the trip is just about hard work. It’s also about seeing new places and getting to know some interesting people. I started out this trip in Pascagoula Mississippi, a city and state I never planned on visiting before this assignment. However, the people there were so helpful and friendly that I would gladly go back to see more of this region. All of you from the Kokomo area know that the major employers are automobile companies. Well, Pascagoula also has a major industry: ship building. 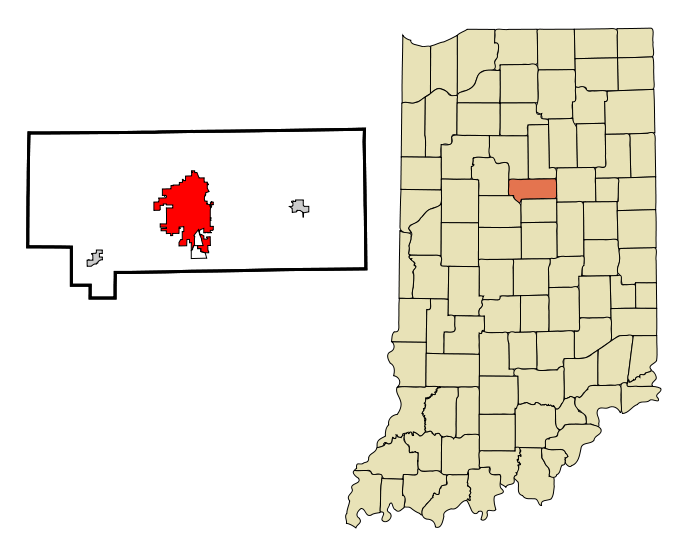 So despite the distance between Kokomo and Pascagoula–about 900 miles–each town depends on an industry for their survival and both towns are incredibly proud of their contribution to society. 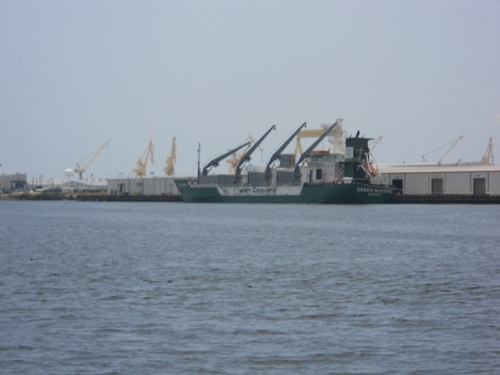 The major industry in Pascagoula is ship building. I have been introducing you to parts of the ship, and today I’m going to tell you about the bridge. Now this is not the type of bridge that crosses a river, but rather the command center of the ship. The crew on the bridge is responsible for the safety of all personal on board and for the ship itself. 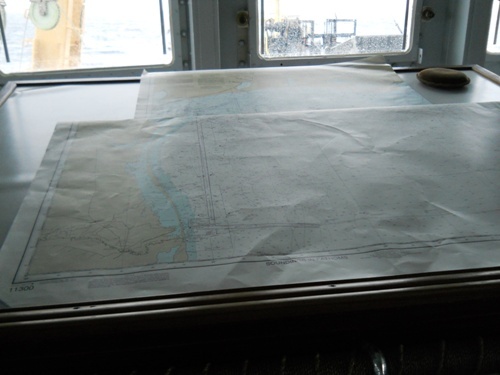 There is a vast array of technology on the bridge which the crew uses to plot our course, check the weather, and to do hundreds of other things which are necessary for the ship to function. This is the chart the bridge crew uses to plot our course. Sea temperature 28 degrees celsius, Air temperature 26.4 degrees celsius, calm seas. The last piece of equipment I’m going to discuss is the trawl net. This is a very large net which is towed along the bottom for thirty minutes collecting all of the fish and invertebrates in its path. At the end of the time allotment a crane is used to pull the net off of the bottom and ropes are pulled to bring it on deck. The bottom of the bag is tied very tightly to keep it from coming open during the run and also to keep the dolphins from pulling it open so they can steal the catch. I have often seen dolphins swimming alongside the ship. I always thought it was just because they were friendly, but I learned today that it is because they want to get our fish. Once the bag is on deck the bottom is untied and the creatures are released into baskets so the total weight of the catch can be measured. Once the catch has been weighed it is taken into the wet lab and sorted by species. Each species is then weighed and measured so the health of the population can be determined. The catch from the trawl must be processed and the data inputed into the computer. 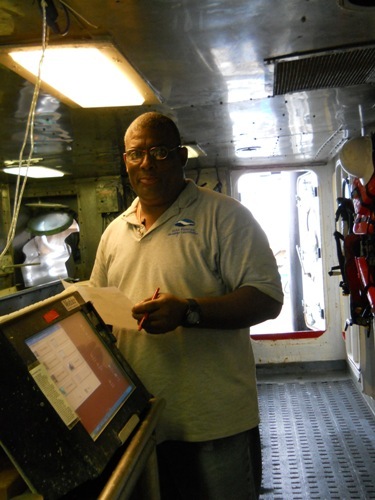 Alonzo verifying the trawl data. 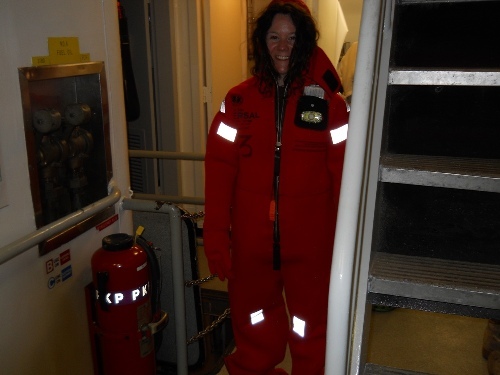 I recently spent some time talking to LT Sarah Harris about her position in the NOAA Corps. This part of NOAA is responsible for supplying each ship with a bridge crew whose officers are charged with protecting the ship and all crew members. 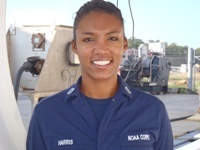 Lt. Harris graduated with a Bachelor of Science degree in Marine Science and after a couple of years looking for the right position she decided to look into joining the NOAA Corps. Luckily for her, one of their requirements is that applicants have to have a college degree in science or engineering, so with her marine science degree she was set. She was accepted to the program and set off for the three-month officer training course which is held at the United States Merchant Marine Academy (USMMA) in Kings Point, New York. During the training the recruits learn maritime and nautical skills, shipboard operations and management, small boat handling, marine navigation, ship handling, seamanship and related subjects. Toward the end of training each student is given a list of possible placements and allowed to choose their top three assignments. The NOAA officials then look through the choices and assign each student based on need and student choice. Sarah was really lucky because she received her first choice which was a ship that sailed out of Hawaii. In the NOAA Corps your sea assignment lasts between two and two and a half years. After that first assignment you are given a land assignment which lasts for three years. During land assignments you are expected to help with administrative duties and training. After the land assignment you are given another sea assignment and the cycle continues. LT Sarah Harris, the operations officer of the Oregon II. Today is Father’s Day so I would like to take a moment to wish my dad a happy Father’s Day. While it is necessary for these scientific cruises to take the scientists and crew out to sea for weeks on end it is difficult for them to be away from the people they love. So if you are at home and your dad is nearby let him know how much he means to you. Here I am holding a large crab we got from the trawl net. The scientific device for this blog entry is called the Bongo net. This apparatus is actually two nets which are mounted on a metal frame. Each net has a diameter of 60 cm and is 305 cm long with a cod end which is the narrowest part of the net to catch the plankton (both plants and animals). At the opening of each net is a flow meter which records the amount of water that passes through the net in liters. This allows the scientists to calculate the total population of each type of plankton without having to collect all the plankton in the area. 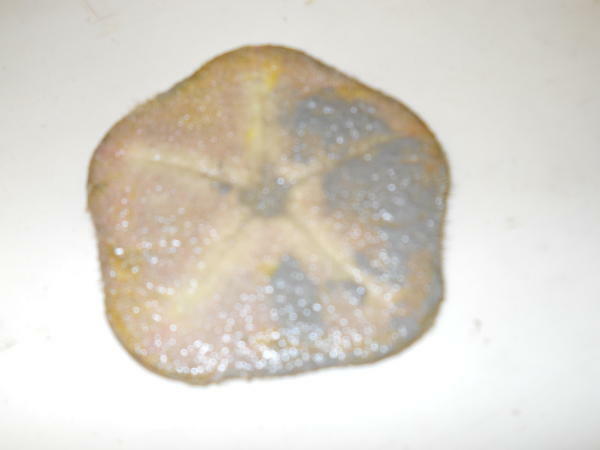 This is done by first finding out how many individuals there are of each species in the sample. Then you calculate the number of liters in the transect (sample area) by multiplying the length of the transect by the width of the transect to find the area in square meters. To find the volume, you multiply the area by the depth which will give you the amount of water in cubic meters. Lastly you have to take the volume in cubic meters and convert it to cubic liters. Now that you have found the amount of water in the transect you are ready to find the number of each species of plankton in that amount of water. 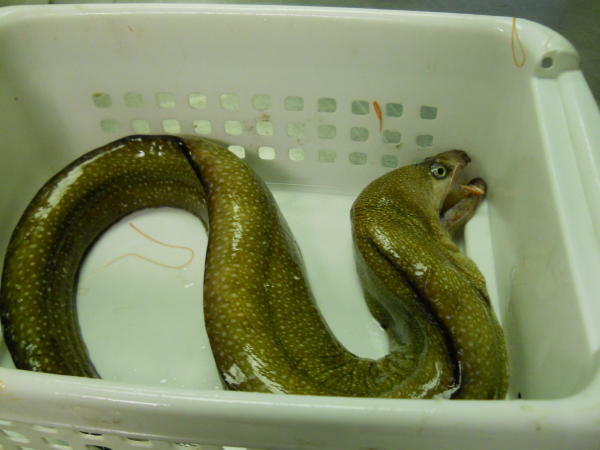 To do this you take the number of individuals in the entire sample and divide it by the amount of liters which flowed through the net during sampling to find the number of the species per liter. 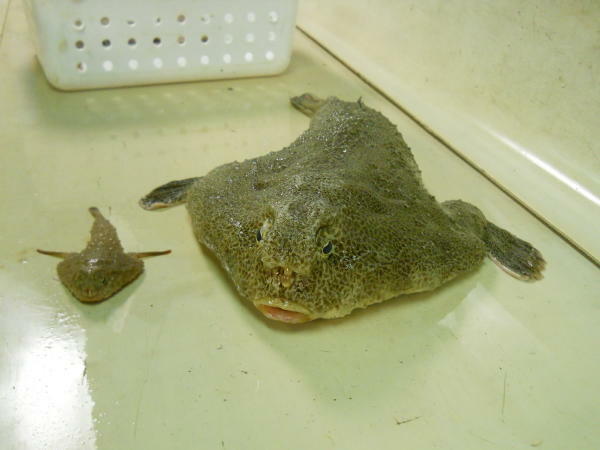 Then you multiply that number by the total amount of liters in the transect which gives you an estimate of how many of that species exist in that part of the Gulf of Mexico. NOAA personnel aren’t the only scientists on board. There is also a volunteer named Marshall Johnson, who just finished his master’s degree at the University of South Alabama where he was working on a project involving larval fish and what they eat. 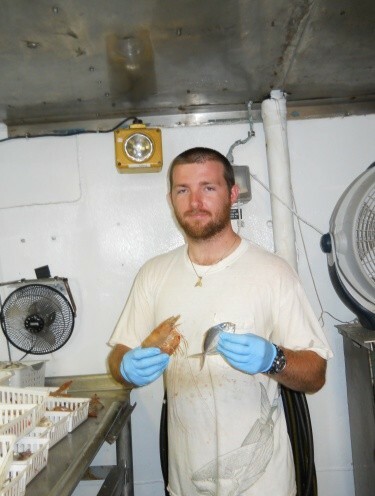 He chose to come on this cruise in order to help a fellow student collect samples for her Master’s degree. Thus far he has been amazed by the vast array of sea life that have shown up in our nets and have been seen swimming around our ship. He has almost finished his Master’s degree and his dream job would be to captain a charter boat so he can share his love of sea life and fishing with other people. His advice for middle school students, “Dream big and follow your goals”. Marshal holding two of his favorite species in the dry lab. We also have a NOAA intern on board named Francis Tran who is going into his junior year at Mississippi State University where he is studying electrical engineering. He found out about the internship through his university and applied by submitting an essay and references to the coordinator of the program. His advice for middle school students, “do something you love, don’t settle”. Francis with his favorite animal the brown shrimp. We have been at sea for one whole week and honestly it is going better than I expected. I was uncertain if I could live on a ship for this amount of time due to my intense independence. I’m not used to giving up control of where I am and what I am doing so I feared I would be tempted to jump overboard and start swimming to shore by now. However I have found that I’m quite content to stay on the ship and am enjoying my time at sea immensely. However, I do miss my workouts. There is some exercise equipment on board but finding the time to use it is impossible. I also miss my daily yoga practices but with the ship pitching from side to side unpredictably I’m afraid of giving it a try because it is quite possible I would be doing downward facing dog pose and the ship would pitch me head first into a wall. In order for a ship to stay at sea for an extended time it must have a well-stocked galley (kitchen) and serve excellent food. As I have mentioned before, the shifts are long and don’t exactly match up with normal meal times so it is important for the crew to be able to grab a little something in between meals. For example since my shift starts at midnight I’m hungry for breakfast at about 2 a.m., not the normal breakfast time, but I’m able to pour myself some cereal so that I am working with a full stomach and am able to concentrate on my work. However, we do have three wonderful meals prepared for us each day. Paul and Walter are the men who work to make sure the crew and scientists are well taken care of when it comes to mealtimes. 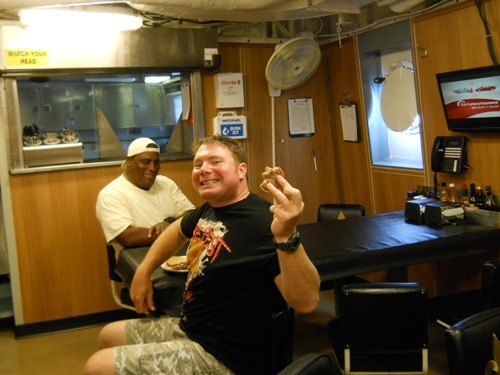 Alonzo and Chris hanging out in the galley having a little snack. Weather Data from the bridge: Sea temperature 27.5 degrees celsius, Air temperature 24.2 degrees celsius, calm seas with thunderstorms in the area. As I mentioned in the previous entry the Oregon II is conducting a groundfish survey. 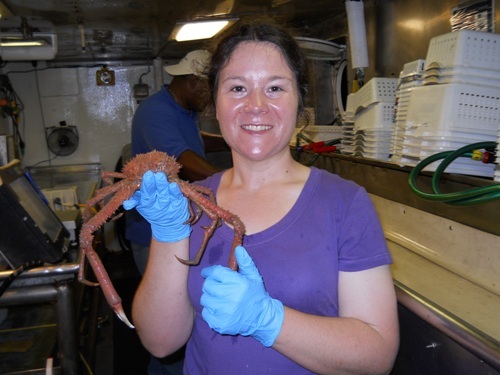 During this research cruise we are studying many aspects of the Gulf’s ecosystem. We start by collecting general information about the water chemistry. To do this we use a piece of equipment called a CTD which stands for Conductivity/temperature/depth. This piece of equipment collects information on the temperature, salinity, fluorescence and turbidity. 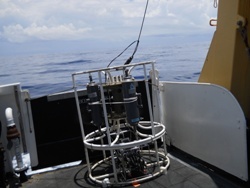 This is the instrument used to measure salinity, called a CTD. I am going to briefly explain what each of these readings are and why they are important to the scientific community. Everyone knows what temperature is but you may not be aware of its importance to the health of our planet. The phrases global warming and climate change have become very popular in the last few years. By collecting temperature data in the same spot year after year scientists can determine if the oceans really are getting warmer. The oceans contain salt water which is the most important difference between oceans and lakes. 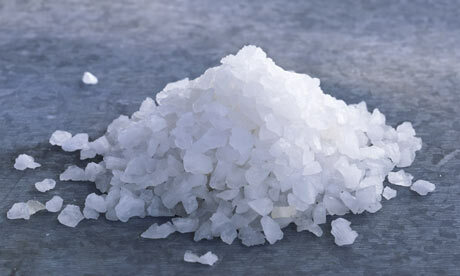 The measurement of the amount of salt in an ocean is called salinity. And the amount of salt in an ocean can reflect the workings of the water cycle. If there is an excessive amount of evaporation due to high temperatures, the ocean will become more salty due to the fact that there is more salt in less water. On the other hand if there is a lot of rain or melt waters from glaciers and mountains then the water will become less salty because now the same amount of salt is dissolved in more water. The amount of salt in the water determines the salinity. Fluorescence is the measurement of light which is connected to the photosynthesis rate of algae. 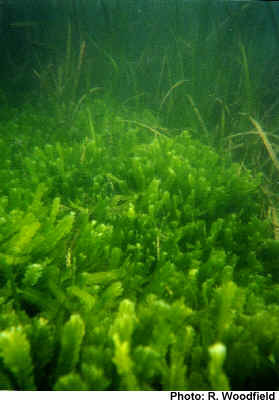 The health of the algae has a direct connection to the amount of carbon dioxide that can be absorbed by the ocean. Algae produces its own food just like a tree so if the algae is healthy, more carbon dioxide will be necessary to carry out photosynthesis and then ocean can absorb more natural and man-made carbon dioxide. 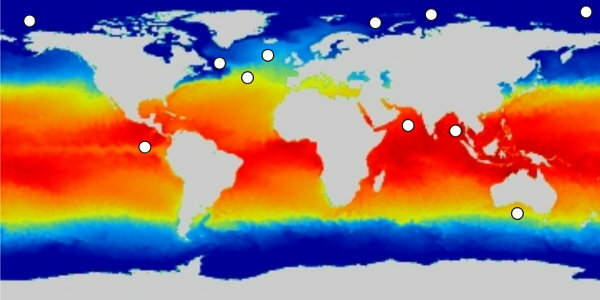 These readings can also tell us how well the oceans are responding to climate change. Turbidity is the measure of water clarity. If the turbidity is high it means that light isn’t getting through to the organisms below which in turn means that the algae and seaweed can’t get the light they need to make their own food. High turbidity can also cause the water temperature to go up due to the excessive amount of silt and particles floating and absorbing energy from the sun. High turbidity can also cause small animals on the bottom of the ocean to be buried alive as the particles settle out the water column. Greetings from the Gulf of Mexico. I have now been onboard the Oregon II for one complete day and am slowly but surely becoming accustomed to the layout of the ship. It has all the comforts of home even if they have different names and look different from the parts of your home. The place I sleep and keep my belongings in is called a stateroom. It is a small space but honestly the only thing I use it for is sleeping . 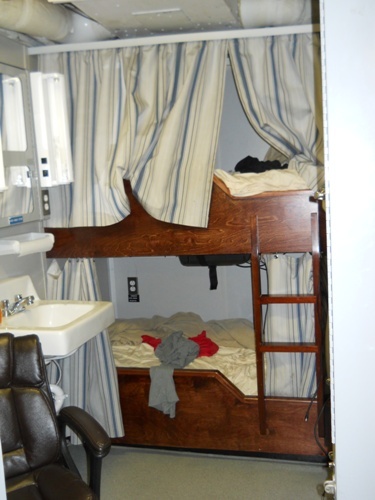 One other difference from your room at home is that the cabinets have latches which keep them closed even when the ship is rolling with the waves. Given the fact that large waves may come up at any time it is important that all personal belonging are securely stored so that they don’t become flying projectiles which can hurt someone. This is where I am bunking for the voyage. 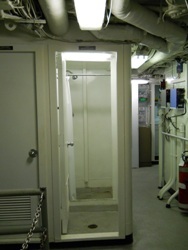 The ship also contains restrooms but they are called the heads. Fresh water is an important resource on the ship as we only brought so much with us so the toilets are flushed using seawater which is very easy to come by out here on the gulf. There are also a couple of showers something which is very important given the fact that our work has the ability to make us very dirty and nobody wants to be stuck on a boat with a bunch of dirty stinky people. This is where we clean off all the dirt that accumulates during sampling runs. This is the suit you must wear during abandon ship drills. My name is Valerie Bogan and I am humbled that I have been chosen to be part of the National Oceanic and Atmospheric Administration (NOAA) Teacher At Sea program (TAS). I learned about this program during a field trip when I was a college student at the University of South Carolina (USC) studying marine science. We had the honor of taking a tour of a NOAA vessel and the captain spoke of the programs offered by NOAA including TAS. At the time I did not intend to become a teacher but life sometimes takes unexpected turns, and here I am twelve years later a teacher in the Teacher at Sea program. I teach 6th and 7th grade science to students at Maple Crest Middle School in Kokomo, Indiana. As you can see from the map, Kokomo is located nowhere near an ocean, but no matter where you live your actions affect the oceans. For example if one of my students releases a balloon, perhaps as a celebration of the end of the school year, that balloon does not magically disintegrate as it floats from view but is instead carried hundreds of miles by the wind. When the wind finally drops the balloon it is just a wad of latex, the air inside is gone, which often falls into a river, which transports the remains of the balloon to the ocean. Once in the ocean, discarded balloons are often eaten by sea turtles because they think it is a jellyfish. Unfortunately, sea turtles can’t digest latex and the mass becomes stuck in their digestive tract causing the animal to slowly starve to death. So you see the simple act of releasing a balloon in Kokomo Indiana, far from the ocean, can cause the death of a majestic animal. During the course of my trip I hope to gain knowledge of other ways Hoosiers are negatively impacting the ocean. Then next fall my students and I will sit down and try to find ways to improve our impact on the environment. 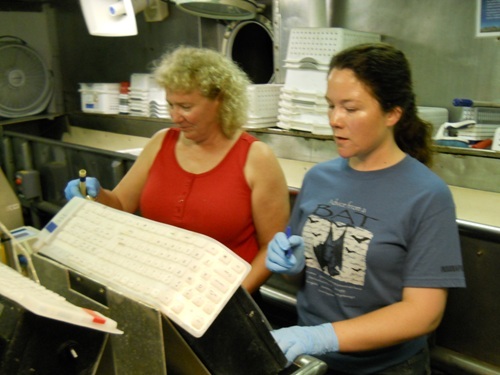 I will be participating in the first leg of the SEAMAP summer groundfish survey aboard the NOAA ship Oregon II. I’m going to wait until future posts to get into the details of the research, but as I understand it, we will be collecting bottom dwelling creatures, such as shrimp, and studying them to determine the health of the population. This is important research because just two years ago the Gulf of Mexico experienced a devastating oil spill when the offshore oil rig, Deepwater Horizon, caught fire and starting leaking oil. This research will allow scientists to determine if there are any long lasting impacts of this oil spill. I am very excited about this trip and I look forward to sharing what I am learning with all of you. As you can see from the pictures below I’m not afraid of seeking out adventure and I have high hopes that this trip will be the best adventure so far. 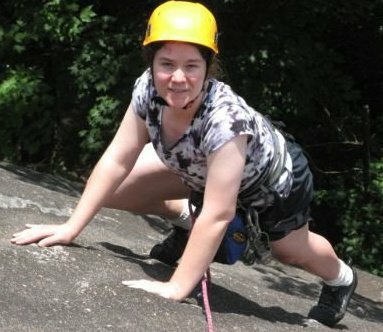 Rock climbing, one of the things I do in my free time.